Netanyahu gave Israelis soul(a sense of own nationalism - a belief in themselves) and here is what we see today - sad day for Israel is all I can say. DISASTER MOVE OF STATE OF ISRAEL AGAINST REAL LEADER(man who lived to serve Israel 24/7 his entire life) WHO IS ACQUANITAINED WITH WORLD'S POLITICS PROBABLY BETTER(and this by far) THAN ANY OTHER POLITICIAN IN THE WORLD. She sacrificed for Israel time and again... these things are also happening during turmoil(that adds extra "bad" to whole thing) between Israel and its enemies which are unwilling to recognize Jerusalem as the capital of Isreal. 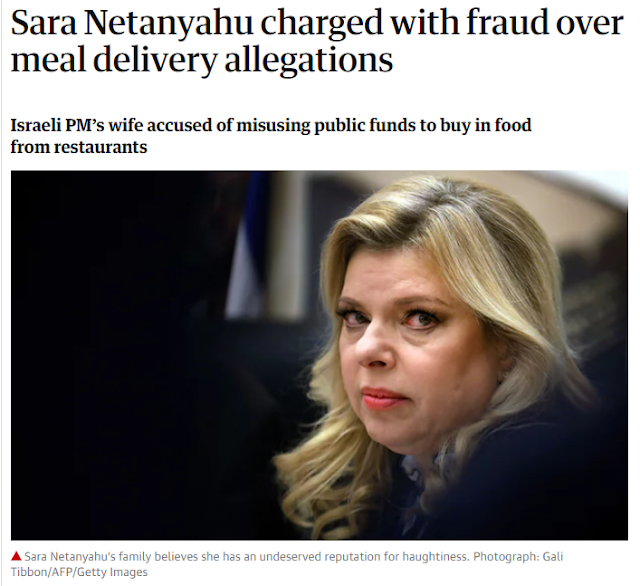 Attorney-General Avichai Mandelblit filed an indictment on Thursday against the prime minister’s wife, Sara Netanyahu, for fraud with aggravated circumstances and breach of public trust in the “Prepared Food Affair” in an explosive development which shook the country. When Leah Rabin was about to be indicted in 1977, then prime minister Yitzhak Rabin resigned from office due to his wife’s scandal. The expectation is that Prime Minister Benjamin Netanyahu is not considering such a move, but the indictment damages him politically in an atmosphere in which the Jerusalem Post recently reported he is likely to face an indictment announcement in the coming months or in early 2019. Though the Post had learned around two weeks ago that an indictment would likely be coming down soon, there were continuous efforts to reach a plea deal down to the end, which left things up in the air and created an ongoing drama. Other media had also reported in recent months that the actual indictment could be filed shortly after the Passover holiday, but then Netanyahu’s defense lawyers approached Mandelblit with a dramatic offer. They offered to return some of the funds Netanyahu is accused of obtaining fraudulently and to take public responsibility, as long as she would not be slapped with any kind of criminal record. Ultimately, despite media reports that a deal might be near, the Post’s sources proved correct that no deal was reached, leading to Thursday’s indictment in the Jerusalem Magistrate’s Court. The trial is expected to start after the fall Jewish holidays and Netanyahu is not expected to get jail time even if convicted, but it was important to Mandelblit that she be given a criminal record for her actions. The indictment was also delayed from May until now following Nir Hefetz, a former close adviser to the Netanyahu family, providing new evidence against Sara Netanyahu. Although Hefetz is primarily a state’s witness against the prime minister for Case 4000 the Bezeq-Walla! Affair, he also provided material against Sara. 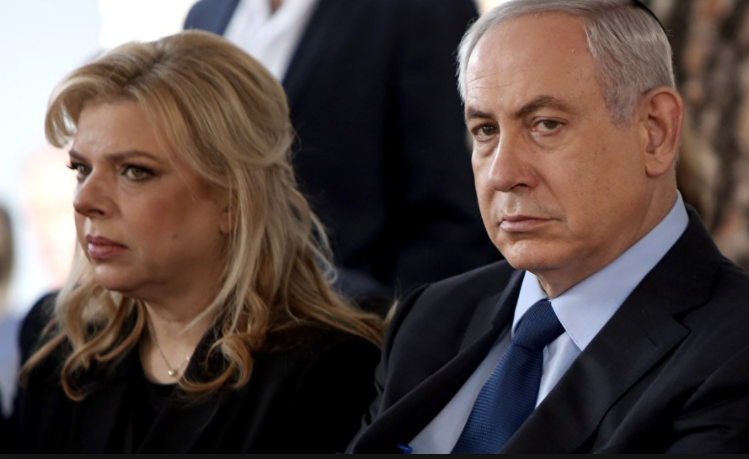 A pre-indictment hearing in January where Sara Netanyahu’s lawyers asked Mandelblit to reverse his preliminary decision in September 2017 to indict her, also had failed to sway him, though Mandelblit issued a statement at the time that he “had an open mind” to their arguments. In the Prepared Food Affair, the attorney-general alleged that from September 2010 until March 2013, Sara Netanyahu acted in coordination with then-Prime Minister’s Office deputy director-general Ezra Seidoff to present the false misrepresentation that the Prime Minister’s Residence did not employ a cook, even though it did during that time. According to the indictment, the two made this misrepresentation to circumvent and exploit regulations that stated, “in a case where a cook is not employed in the official residence, it is permitted to order prepared food as needed.” The two hoped to obtain state funding both for the cook at the residence and for prepared food orders. In this way, the two allegedly fraudulently obtained from the state NIS 359,000 in hundreds of prepared food orders. The indictment states that Netanyahu regularly pressured Seidoff, house managers and others to obtain items for the residence whether they were authorized by law or not. As a result of these pressures, Seidoff sometimes procured items, such as the additional unauthorized prepared food items, despite earlier attempts to explain to her that there was no basis for the state to pay for such items. Also, Netanyahu ordered Seidoff, Naftali and other workers not to reveal the fraud to others. Further, in 15 instances, invoices to chefs who were brought in from outside were falsified in order to circumvent limits on how much could be paid toward outside-chefs. Seidoff directed the chefs, the house managers and Netanyahus' secretaries to falsify the invoices in these 15 instances. Charges against Netanyahu for these 15 instances were previously closed by Mandelblit as there was insufficient evidence to prove that she knew about Seidoff's and the others' actions. The prosecution also indicted Seidoff on Thursday for the same offenses, while adding the offense of falsifying documents and with a total fraud amount of NIS 393,000. Several other cases against Netanyahu were closed in September 2017, but one of them will also impact the indictment. 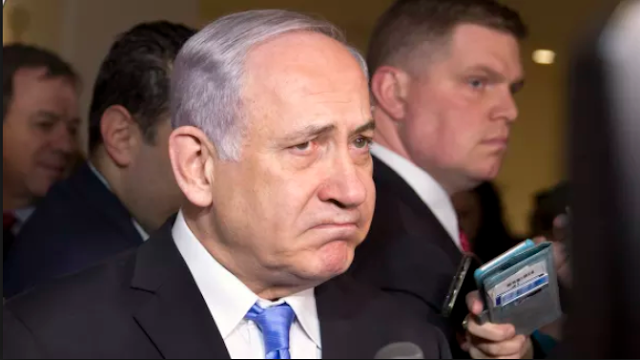 While Mandelbit closed the “Father Homecare Affair” case against Netanyahu due to the small amounts of money involved, evidentiary problems and the difficult emotional circumstances – it will impact the indictment. In the affair, Netanyahu employed S and G for six days and five days respectively to care for her sick and now deceased father. While normally, her father had a different homecare arrangement, during those days that he was staying at the prime minister's residence, his regular arrangement was unavailable. Netanyahu paid S for taking care of her father. However, in addition, S was paid by the state for providing cleaning services. G functioned as a substitute for S when S was unavailable. G was paid by the state for cleaning services. Mandelblit said that since Netanyahu had paid S, was unaware of extra payments to S and that all of the state payments to S and G were small, he would not indict her, but that Netanyahu's pattern of problematic conduct in that case would serve as evidence in the Prepared Food Affair. While Netanyahu was only indicted in the Prepared Foods Affair, Seidoff was also indicted in the Waiters Affair, in which the prime minister's residence in Jerusalem employed waiters over the weekend based on false misrepresentations, and the Electrician Affair, for employing Avi Fahima for electrician work at the prime minister's residence despite knowledge that employing him had been declared an illegal conflict of interest. Responding to the charges, Netanyahu’s lawyer Yossi Cohen told the Post in January that Meni Naftali and other Prime Minister’s Residence managers like him, not Sara Netanyahu, are responsible for the food orders regarding which she is accused. He said Netanyahu’s defenses regarding food orders made in 2010 and 2013, when Naftali was not at the Prime Minister’s Residence, were that those accusations related only to around NIS 134,000. Naftali has already admitted to criminal wrongdoing in this area, so it is just a question of whether the court buys his story or Sara’s about her also being or not being involved. 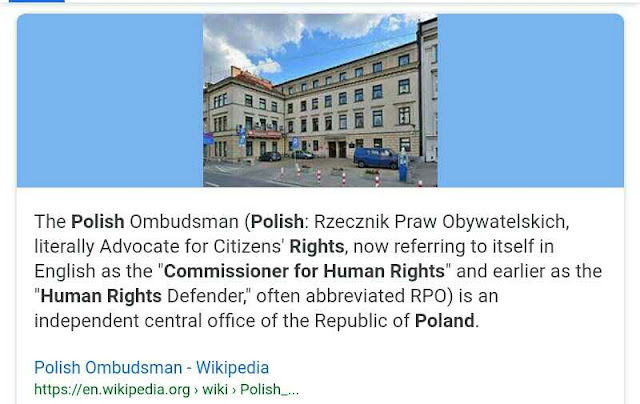 The 2011-2012 period in which he was house manager accounts for around NIS 225,000 of the charges. Cohen further has said that number could be easily reduced to NIS 30,000-NIS 40,000, as many times when prepared food was ordered, the staff cook was sick, traveling or off for Shabbat. Asked if he could prove this argument, Cohen said it is known that the cook was off work for these reasons, and that all he needs to do is raise doubt and force the state to prove that the cook was in fact working at the time. Since he said the state has no way to prove, for example, that the cook was working when around NIS 15,000 was charged for prepared food in January 2011, it cannot prove Netanyahu or anyone else improperly ordered prepared food. Cohen said that if the charges only related to NIS 30,000-NIS 40,000 at most, they could be dropped as relating to an oversight or to a violation too small to be worth prosecuting. Sources close to the case told the Post in September that though there was unanimity within the prosecution about indicting Mrs. Netanyahu in the Prepared Food Affair, there were differences of opinion within the prosecution about closing some of the other cases against her. The Sara Netanyahu cases jumped into the headlines in February 2015 as part of a State Comptroller report and “Bottlegate” and other now closed cases becoming household names. It became a full criminal investigation starting in July 2015.